I 'm sure the first question is, "Where the heck is Swansboro?" That's not very hard to answer. This Google map link will give you a quick look at Swansboro. It's pretty obvious that the town is on the coast. With some typing you can quickly figure out that Swansboro is nearly 71 miles east and somewhat north of Wilmington. It's also 135 miles from Raleigh or 254 miles from Richmond. Most likely you have to want to be going to Swansboro or possibly Emerald Isle to end up there. Visiting Swansboro or Emerald Isle means you're headed to the beach, going boating, maybe fishing, or just looking to relax and enjoy some great food and a little slower pace. Maybe you just want to wander all the old shops in Swansboro, but if you're a guy that's probably not on the list. This part of the NC Coast, often known as the Crystal Coast is definitely not Myrtle Beach or Kitty Hawk, but that's a great thing in my book. I enjoy roadside produce stands and fish markets more than I do golf courses, traffic, and crowds. The smaller crowds, fewer golf courses, and more manageable traffic are more to my liking in the Swansboro area than a number of spots we've visited. I also like the fact that the area has a stable year round population and is fast becoming a desirable retirement area. Since its fame hasn't spread as widely as North Carolina's more famous beach areas, there are not as many giant beach houses. It's known as a family beach area which is fine with me. You can also make a left turn which is increasingly hard to do in places like Duck, and you don't have to spend three hours in traffic waiting to get started on your way home. It takes us between five and six hours to drive from Roanoke, Va. to Swansboro. The time has a lot to do with how long we stop for meals or other things. This Google map will give you a general idea of how to reach Swansboro. Depending on how you get to Interstate 40 it's a little over three hundred miles. Since I enjoy driving on two lane roads, I often take Route 220 South to Route 58 East all the way to the Danville bypass and then catch 86 South to Hillsborough and finally Interstate 40 East. If you live a little further west in Southwest Virginia, it actually could be quicker to take I81 South to I77 south, then I74 South to Highway 52 South to the Interstate 40 East bypass at Winston-Salem. Whatever your favorite route to Interstate 40 East, once you get on it, stay on it until you arrive at exit 373 which allows you to pick up Route 24 East. Follow the signs to Jacksonville, and eventually Morehead City and Swansboro. There are lots of reasons why you might want to visit Swansboro, a town which has managed to survive and thrive since 1783 despite numerous challenges. First of all it is a trip back in time. The people are very friendly and no one seems to be in rush except maybe the people who have just gotten there. Many of the people headed to the area, zoom right past Swansboro and head over to Emerald Isle to a beach house they have rented. You can find a big castle sized one it you want it, but there are plenty of reasonable size ones that evoke memories of a simpler time. Renting a beach house is a great thing to do, but this being North Carolina you don't have to have a house on the beach to enjoy the beach. There are dozens of public beach access points including a very nice one just after you come over the Highway 58 bridge to Emerald Isle. It is one of our favorities and is just off Islander Drive. You just have to watch carefully for the signs. It has lots of parking, a nice boardwalk to the beach, changing rooms, picnic tables, and bathrooms, along with beach volley ball courts. On the way to it you get to take a time trip through some old amusement park rides. There are lots of other beach access points, you can find them listed at the Crystalcoast.org site or the official Emerald Isle Town site. If you are a little more adventurous you might might want to go over the Hammocks Beach State Park and take the small pontoon boat ferry over and experience a beach with lots of room. It's just a couple of miles from Swansboro. I haven't made it over to the island beach yet, but I'm told the trip takes fifteen minutes, and there is a packed gravel trail of about one half mile to the beach. It was too for a hike the last time I was down. The ferry runs either every half hour or hour depending on the day of the week and the time of the year. Hammocks Beach State park has a great kayak or canoe launch point and the waters look perfect for kayaking. If you get bored with all the beaches in the Swansboro area, you can take an hour or so trip up to Harkers Island which is a great access point to Cape Lookout. You can read a review of one of my trips there in "The Best Twenty Dollars You'll Ever Spend." On the way to Harkers Island, you face the obstacle of Morehead City. There is a trick to getting around Morehead without going down the main drag. When you take Highway 24 towards Morehead, you eventually run into Route 70 by the malls on the outskirts of Morehead City. Instead of turning right on Route 70, you should just go straight across and you'll be on Bridges which isn't on some of the maps, but it you stay on it until you are forced to turn right and then left back onto route 70, you'll save about 10-15 minutes getting through all the stoplights and traffic of Morehead. Once you get back on Route 70 just before the bridges to Beaufort, you're not far from Harker's Island especially by boat. Just stay on Route 70 until you see the signs to Harkers Island. There are actually plenty of boat rides from Beaufort to Cape Lookout, but I enjoy the drive to "Down East". This site has some pictures of the trip through the area. On your way back you might want to stop and eat in one of the many fine restaurants in Beaufort, or visit the historical site and the great NC Maritime Museum. More details are available in my Beaufort Travel Guide. You can also swing by Fort Macon State Park. I would also highly recommend the NC Aquarium as a break from the beaches. From Emerald Isle, it is probably nine miles or so up to the aquarium in Pine Knoll Shores. It could take fifteen to twenty minutes for the drive during beach season. Of course, going to the beach requires eating out unless you want the ladies of the house to go on strike. My advice for avoiding the crowds is to either eat early or eat on the shore side. There are a number of really good restaurants in Swansboro. I have reviewed and highly recommend, "The Icehouse Waterfront," and "Riverside Steak & Seafood." Our favorite lunch spot is Santorini Grill. If you're looking for a grocery store, I've been very impressed with the Lowe's Food Center at the same Highway 24 and 58 intersection. If you need a place to stay and haven't gotten a beach house, I can recommend the Best Western at Silver Creek. The rooms are very clean, they have a great pool, free continental breakfast, and very reasonable rates. It's five minutes to the beaches. Though we haven't tried it, I've been told that the Waterway Inn is also very nice and right on the water, but I've never seen a vacancy there, so I would book well ahead. I'm not much into lying on the beach these days. I'd rather be fishing at least in the fall or spring when it's not too hot. I do really love walking on the beach. North Carolina is one of the greatest places in the world to do that simply because all the land between low tide and mean high tide is public beach. The beach is a great resource for everyone. The one thing I really like about the beaches of the Southern Outer Banks or SOBX is that people of all ages from almost anywhere seem to have a great time. Once you're done with your beach walk, you can enjoy a cone of ice cream at the many local ice cream places including the Ace Hardware in Swansboro or some special ice at the Polish Water Ice place in Emerald Isle. Update 2018: We have been living in the Swansboro area for twelve years. The latest information can be found in our travel guide to the Emerald Isle area, A Week at the Beach. The full color 2018 version is 152 pages with over 100 color images. It is available at the Emerald Isle Town Office for $20 or from Amazon for $19.99 at this link. The book is prime eligible. There are black and white and Kindle versions for much less but many readers believe the color photos are well worth it. 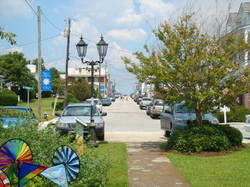 You can also find recent articles about the area at my CrystalCoast.me web site. I just stumbled across your article about Swansboro. My husband and I found Swansboro by accident 2 years ago. We traveled to Edenton, and Hertford looking for a place to purchase our retirement home but nothing "felt" right. At the last minute we travelled to Swansboro, and we both said the same thing at the same time "This feels right". We purchased property, had our home built and I am thrilled to report that we will be moving from CT to Swansboro in January 2007. We've visited Hammocks Beach and met several volunteers who made us promise to join them when we arrive. It's a beautiful piece of propoerty (similar to the dunes of Cape Cod) Be sure to visit. I hope we get the chance to meet you! Thanks for your articles. We love the area, and I'm very impressed with the Hammocks Beach area. If your home is up in that area, you've got a wonderful spot. Now that the weather is cooler, we'll be visting the island the first chance we get. We just moved into our place last week so we're still working through all the things that need to be done. I can't wait to get a kayak and bring down my bicycle. I don't know what it is about the area, but it does just feel right. The "Spots" are running right now, so I had those for an evening meal the other night. They were very tasty. On our last trip before moving into the house, we stayed at Waterway Inn. Though the rooms are small (and spotless), the charm of staying on the water is hard to beat. I think my favorite part besides the friendly people and relaxed lifestyle is that I can find a beautiful water scene almost anywhere. This is the view from our dock. It's just one that is repeated a thousand times over in the area. Water is such a part of life in the Swansboro area, that it is fortunately almost inescapable. We'll look forward to meeting you once you escape the snow and ice. Swansboro is a great place to retire. 306 Jasmine South is a beautiful two bedroom detached condo in The Villages of Swansboro, a 55+ retirement community near the White Oak River. To see this property call 910-358-3770.
computer I can find a beautiful water scene almost anywhere. Well, we actually live not far from Swansboro now and do really enjoy the area. 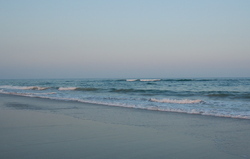 The people are friendly, the seafood great, and the beaches over at Emerald Isle never very crowded. This week is going to be a particularly warm one, but come on down. I have never heard of Swnasboro before but it seems a very interesting and beautiful place and I am thinking ot travelling to it next summer with my husband. Thanks so much for your information and pictures. You're doing a super service for the rest of us who are still in the searching phase! My wife and I moved to Swansboro a little more than two years ago. Since then, I bought my boat and I'm now looking for something smaller to run about the back bays. The one I have now drafts too deep for this 24". If anyone knows where I might find a 15-16' with a 10-25hp outboard please e-mail me with the info. I love it here, and plan to stay until I'm called home! I have lived by the sea all my life from Long Island, NJ, to here. Nothing compares to this lovely little corner of the earth! Thank you so much for this article. My Husband and I are moving there next month and I have been a little nervous about the move. This reasures me that is will be great. I am really looking forward to it. Some more yankees who have fallen in love with this area! My husband and I have rented a house on the island for almost 2 years. We will finally be moving to our own place in Swansboro at the end of May. We grew up near the CT shoreline and have been searching for a place that reminded us of the wonderful little small towns along the coast. Cape Carteret, Cedar Point, Swansboro and the island are all just right. We feel so blessed to be living here but would be hard pressed to name a favorite spot- there are so many beautiful views-who can pick just one?